At the Silver Spring Transit Center there is an information center called Trips. Operated by Montgomery County's Department of Transportation, it provides information on transit and sells various types of transit passes. 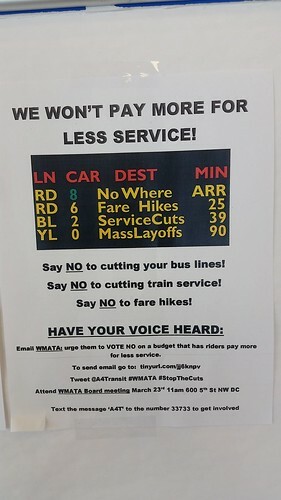 included an advocacy flyer concerning the FY2018 budget for WMATA, which calls for fare increases and service decreases. I wasn't surprised that the flyer was still up, although the date for action had passed. I think in the past I've suggested that contact information for WMATA Board members be posted in Metrorail stations. A couple years ago, then BART Board Member Zakhary Mallett suggested this for their stations, although I don't think the proposal was adopted ("BART director wants to display board's photos in cars, stations," San Francisco Chronicle). But seeing the flyer made me realize that at the very least, contact information for the WMATA Riders' Advisory Council should be posted, as well as an information board broadcasting their actions. WMATA does post information boards in stations when actions/hearings are scheduled concerning fares and service changes. Sometimes you will see information from chapters of the National Association of Railroad Passengers posted in train stations. You don't see this at Union Station, but you do at Penn Station in Baltimore (at least back when I used to ride MARC to Baltimore a few days each week for work). The various "commuter stores" -- Arlington, Fairfax, Montgomery have versions -- should probably post this kind of information too. 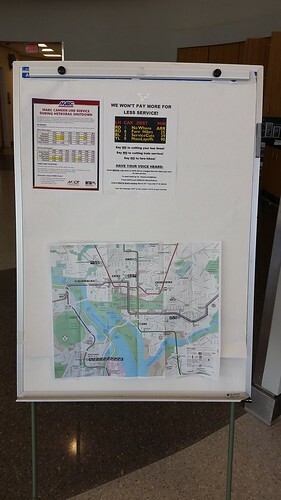 Note from a design perspective, the information board is a "staff intervention" designed to call out information on frequently asked questions (e.g., the map of the Downtown Metrorail Stations is posted) and communications of urgency, such as MARC railroad service changes designed to aid people impacted by Metrorail repair shutdowns. The NARP board was still in Baltimore Penn Station in January. It does seem to move around a bit within the station, though. Hey Richard, Paul M. here. I am pretty confident that the RAC did not sponsor the flyer. But we certainly want folks to get involved. Our next general meeting is the first Wednesday in May. I will update you when the date approaches. Sound good? Yes. I've never been to a meeting myself. Perhaps I should start. I still haven't written up the combined VARP/NARP meeting last Saturday in Alexandria. It was very good. ... I need to write about the VA State Rail Plan and submit comments. Unfortunately, they have some planning philosophy issues on the part of the Commonwealth Transportation Board that have long term negative consequences. oh, I didn't mean to imply that the Riders Advisory Council sponsored that flyer, just that there should be promotion of the RAC at each Metrorail station and transit center. Similarly, e.g., Arlington should be promoting its transportation commission in Metrorail and transit stations (like Shirlington) as part of the same process. Rockville has a transportation commission too. ArCo used to have a youth transit commission but I am not sure they still do.